Surprising just about everyone on the island, Handa not only has friends, but friends that are coming to visit! However, both of them are arguably even more stereotypical ‘city folk’ than Handa himself, and have some trouble during their visit to the countryside. Needless to say, numerous incidents happen over the next few days after their arrival. In this volume, the story of Barakamon actually made an interesting change in pace: instead of the chapters being episodic tales of Handa’s experiences, there was instead a more chronological and focused story following the exploits of his two guests. While I do enjoy the less focused story, it was nice to have a more plot-centric (relatively speaking) volume while still maintaining the same general vibes from the previous books. One thing that the third entry in the series also had that I found improved from previous iterations was a greater amount of evident character development from Handa. Previously, different experiences on the island were shown to change his thinking, but this volume felt more like an application of these lessons as Handa is re-confronted with what he had left in the city when the city more-or-less comes to him. His behavior towards his old friend Kawafuji is openly remarked upon by him as having changed, both physically and mentally. Of course, the comedy of Barakamon continues, and with new people for the kids to torment comes a new batch of hilarious moments. The humor, far from growing stale, seems to be plugged into some sort of ultimate renewable energy source, because new elements added to the story feel like they organically augment the comedy without feeling unnecessary. The new characters themselves, Kawafuji and Kanzaki, both are interesting additions to the cast as they both serve as foils for different facets of Handa. Kawafuji is Handa’s long time friend, and is significantly more relaxed than him, while Kanzaki is a young caligrapher who idolizes Handa and puts on a mask in public to gain publicity. Both serve to develop Handa as well as provide amusing moments throughout the volume, and are a welcome (if temporary at the moment) addition to the cast. In comparing city dwellers to folks from the country, Barakamon makes several cultural references that are not easy for North American readers to understand for obvious reasons. Thankfully, Yen Press has included some excellent translation notes at the back of the book that I highly recommend you refer to if you feel like you are missing the joke at certain points. 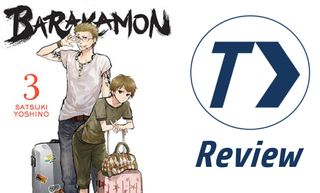 Barakamon continues to be a heartfelt and amusing tale in its third volume. The more focused story and new set of characters are welcome additions to the island, and Handa’s development continues as he begins to apply the lessons he’s learned from his experiences. While I would recommend checking the translation notes for cultural explanations, I also recommend fans of the previous two volumes pick this one up, it’s quite good. Barakamon Vol. 3 was authored by Satsuki Yoshino and published by Yen Press on February 24, 2015. Barakamon is an ongoing series in Square Enix’s Gangan Online magazine, and received a single-cour anime adaption by Kinema Citrus in Summer 2014. Volume 4 is currently available in English and volume 5 will release in North America on June 23rd.